Don't expect to see any manufacturer other than Adidas in this list as Adidas provide the shirts for all of the teams in MLS. We start with one of the Canadian teams from MLS. 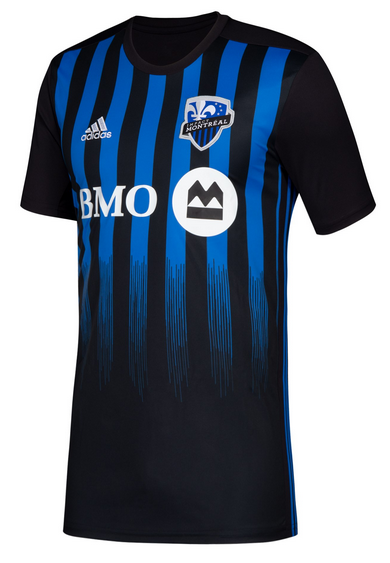 Throughout my time collecting football shirts, Montreal shirts always seem to hold their value really well. They very rarely drop their prices so picking one up does usually result in some significant outlay. I suspect that this shirt will follow the same pattern as the design of this shirt is really strong. I am a big fan of shirts that feature a gradient effect and this one here has been executed perfectly. I like how the bottom of the shirt is entirely black and you find yourself peering into the darkness trying to find some semblance of blue. I feel that this design would really suite an Inter Milan shirt also. Black and blue are a match made in heaven when it comes to football shirts so pretty much any composition of these two will result in a great football shirt. I feel that the sponsor is decently positioned though the giant circle image is a bit overzealous. I am also a fan of the club logo so seeing that in all of its glory is nice. I usually say that I would look into picking this shirt up once the sales have begun but as mentioned earlier I doubt that this shirt will drop in value all that much. Maybe I will put aside a few pounds a week so by the end of the season I will be able to buy one of these shirts regardless. Thanks to David Beckham LA Galaxy shirts were the first ones I remember being sold in the UK. Certainly en masse. Since then they have been producing really well put together pieces. I have gone with the away shirt though this time as I am a sucker for a pixel effect. It reminds me somewhat of the Emelec shirt that I own already. The colours used for this shirt are funky and not typically prominent which is adds a unique feel about it. Almost looks like a camouflage that you would find in a Call of Duty game. One thing that I have begun to notice on a lot of these shirts is that the sponsors are being positioned higher up than what you would usually expect. I don't know if it is just because it is a relatively new phenomenon but I find myself undecided on whether or not I like it. I guess in this instance it looks decent enough so I will get used to eventually. I think I will do my best to pick this shirt up for my collection as I do want to add more shirts to the MLS section of it and this design is one that I really like. I suspect it will be later on in the year though when I am able to pick one up. This shirt certainly has a unique design. I don't know if it is just me who sees this, but I am seeing wooden cabins on each of the horizontal stripes, most of which have a large window in the center of it. That might just be me putting a physical object to a bunch of lines. The greyscale style colours used for this shirt work really well, especially against the deep red of the YouTube logo. 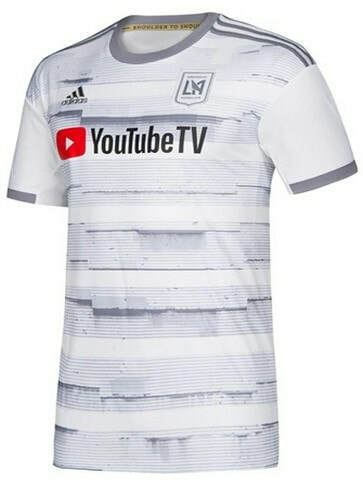 On the topic of the sponsor I still find it interesting to see YouTube sponsoring a football team. I understand why this is the case and that is because the YouTube founder is also one of the founders of the football club so that crossover makes sense. I appreciate the fact that the club logo is the same colour scheme as the rest of the shirt. I would say that as a football shirt collector any of the shirts released either this season or last season would be a good choice, as the club is only in its second year and as such these shirts will be valuable 10-15 years down the line. I do plan on picking up this shirt at some point as it ticks most of the boxes that I want for when it comes to adding a shirt to my collection. We are at number two in the list and it was a tough choice between this shirt and the one that eventually ended up placing top. This shirt would have easily placed 1st if the shirt was designed like the shirt suggests it is. You might be wondering what I am referring to here but all I ask you to do is look at the diagonal strips across the front of the shirt. When I first saw this my mind instantly jumped to the designs of the Valur and Bologna shirts that I have in my collection. 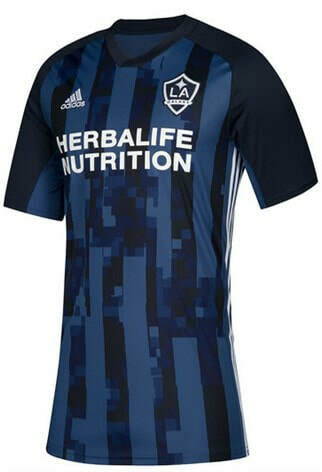 Both of those shirts have diagonal stripes running across the front, with the stripes being made up of the names of the club supporters and members. This is a cool feature and one that I would promote every time. So when I saw this shirt I thought I had found another example of this shirt design that I would be able to add to my collection. 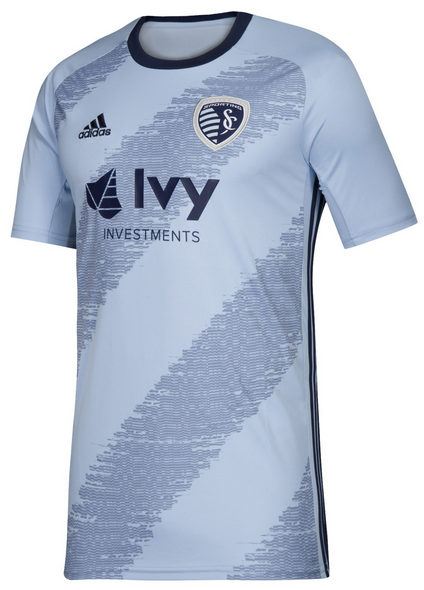 Unfortunately though with a closer inspection you will notice that the lines are nothing more than random lengths of darker blue material that have no importance other than the overall look of the shirt. I am not saying that the design of the shirt is bad or else it wouldn't feature this high but I also cant say that I am not disappointed to see just random dark blue sections. The colour of the shirt is really nice and I like how the colour of the sponsor fits in nicely with the overall look of the shirt. I will certainly be keeping my eyes open for this shirt as the season progresses. We reach the top of the list and I am satisfied that this shirt is deserving of the top position. Certainly as a football shirt collector this has that standout feature that we are always looking for in a football shirt. Quite clearly what I am referring to here is the design of the shirt and the red smearing across the front of the shirt. That is the only word I can think to use to describe this style as it looked like some sort of crime scene investigation with all the red splattered on it. 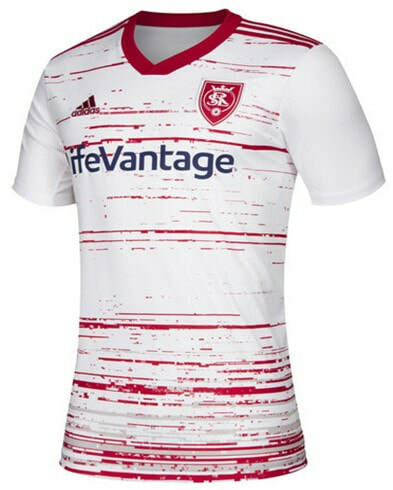 Also this might be one of the few occasions where the Adidas stripes play right into the overall design of the shirt as they also take the role of random red lines on the shirt. I am not sure if I would have liked to have seen a few more red lines across the front of the sponsor or if I would have liked this section to be completely clean but other than that this shirt must go down as a classic in the years to come. It isn't too often you see an MLS team releasing a shirt with this amount of personality so if you are a collector and are wondering what you should go for next I would happily suggest buying this shirt as it will stand the test of time for sure. I know that I will definitely be picking up one of these shirts when the time is right.